Freeheld premiered at the Toronto International Film Festival in 2015, and will be released in the UK on the 19th Feb. 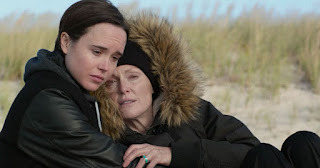 The true story of New Jersey Detective Laurel Hester (Julianne Moore), diagnosed with stage four terminal cancer, and her fight to have her pension allocated to her domestic partner Stacie Andree (Ellen Page). tarting in 2002 when they met, I found myself liking the film a lot more than I thought I would, and this is mainly due to the excellent script by Ron Nyswaner (Oscar nominated for Philadelphia). There is a raw honesty to the film and its depiction of how only a short time ago equal rights were still very much being fought for. Julianne Moore, one of my favorite actresses, is excellent as Laurel. Featuring a very Farrah Fawcett hairdo, which along with her wardrobe added a 70's feel to the film, she portrays a closeted cop working twice as hard as her male colleagues in her attempt to make it to Lieutenant. Even though it was only 14 years ago, she is not the only gay officer living a secret life in her precinct. Michael Shannon, stars as her partner Dane Wells, trying unsuccessfully to hide the crush he has been nurturing on Laurel over the years. Although a seemingly odd couple, with Laurel being much older than Stacie, the love and compatibility shines through. Laurel does eventually come out and the couple buy a house together and settle into domestic bliss (pet dog included). The script propels the story along with plenty of sharp comebacks by the tough Laurel. Humor comes in the form of Steve Carell, playing Steven 'with a V' Goldstein, a Jewish gay rights activist lawyer, with a penchant for purple. He openly admits, to the dying Laurel, that this is the dream case he has been waiting for to gain publicity for the gay rights movement. Ellen Page, as tomboy mechanic Stacie, is perfect in the role of gentle and quiet girlfriend, distraught over the prospect of the love of her life dying early from cancer. Page is also credited as a producer, this being her second film to produce, after 'Into the Forest' in which she co-stars along with Evan Rachel Wood. Since her dramatic and heartfelt coming out on Valentines day 2014, Page has become one of the more politically active stars, involving herself in the LGBTQ movement and the fight for equality. What is interesting is how Laurel Hester, as a police officer is concerned with 'Justice' and equality, while Steven Goldstein fights for Marriage rights. This is not the first film about their struggle, in 2008 'Freeheld' won an Oscar for best documentary. Not just a 'gay rights' film, or a 'cancer' film, Freeheld is a sweet and uplifting tale of the struggle for justice. I definitely recommend taking some tissues, there wont be many dry eyes by the end.